Be the first to share your favorite memory, photo or story of Lawana. This memorial page is dedicated for family, friends and future generations to celebrate the life of their loved one. 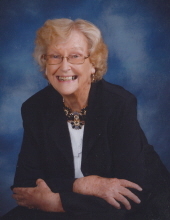 Lawana M. Hartzell, age 86, of Sullivan, Missouri, passed away Wednesday, April 10, 2019. Lawana Mae was born on March 23, 1933 in Elvins, Missouri, the daughter of James Burl and Genevieve (Hawk) Newcomer. She grew up and attended school in Elvins, Missouri. Lawana was united in marriage to Melvin “Boone” Hartzell on June 25, 1950 and they were blessed with four children: Jim, Mark, Mike and Kelley. Boone began working at Pea Ridge Mines, and in 1960, they moved to Sullivan to raise their family. Lawana and Boone enjoyed taking their children camping. In fact, later in life, Lawana and Boone became campground hosts at Table Rock Lake and Bennett Springs Park. Lawana was a member of Grace United Methodist Church in Sullivan and she enjoyed visiting with people. She always loved planting flowers and spending time with her grandchildren. Lawana will be lovingly remembered and missed by her family and friends. Lawana is survived by two children, Jim Hartzell and wife, Judy, of Sullivan, MO, and Kelley Schoolcraft and husband, Brett, of Sullivan, MO; eight grandchildren, Dianna Bartle and fiancé, Jeff Blanton, of Sullivan, MO, James B. Hartzell and wife, Jennifer, of Sullivan, MO, Dustin Schoolcraft of St. Clair, MO, Derek Schoolcraft of Pensacola, FL, Mindy Mady and Michelle Neville, along with their spouses, of the state of Washington, Timothy Thomas and wife, Jen, of Munich, Germany, and Janey Hartzell of St. Louis, MO; nine great-grandchildren, B.J. Bartle, Kyle Weiskopf, Emilee Carthy, Kaylee Schoolcraft, Molly Ainsworth, Mina Ainsworth, Devin Hartzell, Nicholas Wildy, and Bailey Hartzell; one great-great-grandchild, Reid Carthy; and one sister-in-law, Glenda Newcomer of Yuma, AZ; nieces & nephews, other relatives and friends. She was preceded in death by her husband, Boone Hartzell; two sons, Mark Hartzell and Michael Hartzell, and her parents, James Burl and Genevieve (Hawk) Newcomer. A Memorial Service will be conducted at 4:00 PM, Monday, April 15, 2019 at the Eaton Funeral Home in Sullivan, with Pastor Donna Schofield-Dolle officiating. Lawana’s family will receive friends from 2:00 PM to 4:00 PM, Monday, at the Eaton Funeral Home. Friends may send online condolences to Lawana’s family at www.eatonfuneralhome.com. To send flowers or a remembrance gift to the family of Lawana M. Hartzell, please visit our Tribute Store. "Email Address" would like to share the life celebration of Lawana M. Hartzell. Click on the "link" to go to share a favorite memory or leave a condolence message for the family.